LiteCage real mount on A7rII, It's already at the final testing and adjusting! - All buttons, functions and doors on the camera are completely accessible. - It's delivers mounting points on all four sides, and all camera-top accessories including monitors, external recorders and focus units. 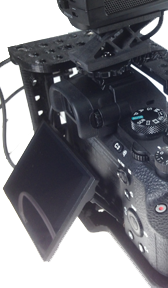 - The optional rod base attaches to the cage top and bottom and delivers flexibility for placing accessories such as a follow focus and matte box. Will retail for $299 US., expected ships in October 2015. LiteCage for Sony A7rII compatible with A7II and A7rII. Pre-order now you can get FREE Skier chrome vanadium steel tool.If you are interested in purchasing or want to learn more, just fill out the contact details, we will contact you. Pre-order now you can get FREE Skier chrome vanadium steel tool. Skier have a new update on the LiteCage series, the support cage designed specifically for the A7 MKII and A7R MKII. The LiteCage for A7 MKII’s form-fitting design matches the ergonomics and size of the A7 MKII, adds needed support and mounting features, and minimizes bulk and weight. Complete protection and mounting points – The LiteCage for A7 MKII mirrors the compact design of the Sony A7 MKII and closely wraps the camera to maintain its beautiful natural form factor while providing 360 degree camera casing for maximum security and support with minimal bulk and size. Complete camera access—The LiteCage for A7 MKII is designed to ensure all buttons, functions and doors on the camera are completely accessible. Flexibility – The LiteCage for A7 MKII delivers mounting points on all four sides, and all camera-top accessories including monitors, external recorders and focus units. 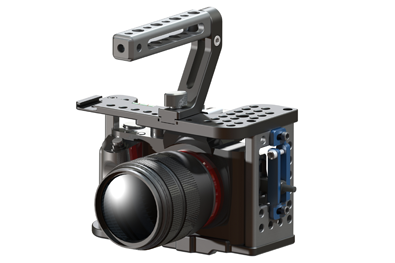 Powerful LiteCage– the optional rod base attaches to the cage top and bottom and delivers flexibility for placing accessories such as a follow focus and matte box.